But when you’re gaslighting a ten-year-old, it’s good to diversify, and use all the available talent. 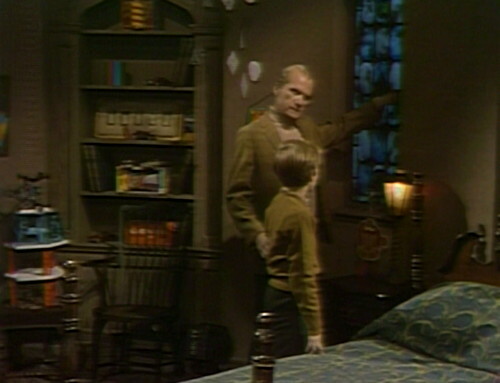 And the real kicker to the scheme is revealed when David tells his father about the bat attack, and Roger notes that the window is closed and bolted. So the bat came in through the window, messed with David, flew out again, and then closed and locked the window from the outside. How would you even think of training a bat to do that? It’s genius. Advantage: ghoul. Unfortunately, that pretty much signals the end of anything interesting that might happen in this episode. The bat attack was thrilling and intense, as you might expect, but it’s gone now, and there’s nothing left to do but have unfulfilling conversations with grown-ups. 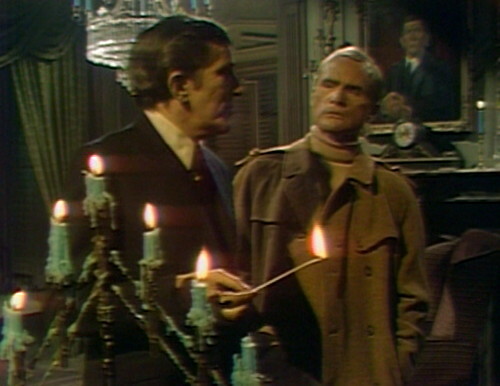 Roger walks over to the Old House to apologize to Barnabas for David’s recent break-in, and then halfway through the scene, it pretty much falls to pieces. 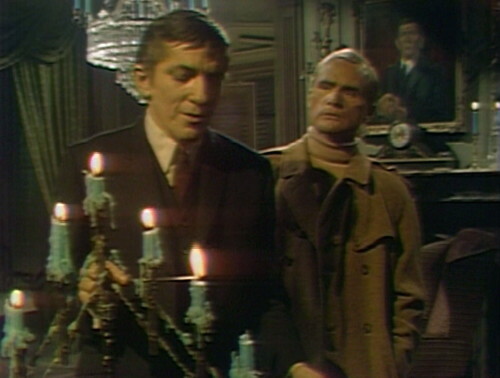 It’s one of those good old-fashioned slow-motion disasters that make watching Dark Shadows such an invigorating experience. 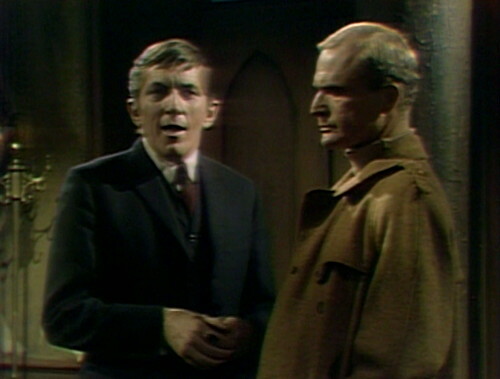 Roger tells Barnabas that David is obsessed with the idea that there’s something spooky in the Old House basement. Barnabas starts to stammer, which is always the sign that he’s about to get script-adjacent. Sure enough, within a couple sentences, he’s saying “uh” after every few words, and directing panicky looks at the teleprompter. Roger, like a true professional, just pretends that everything is fine, and makes no attempt to resuscitate. At this point, the director makes the unusual decision to go in for a tight close-up on the actor who’s in visible distress. Roger: Sarah appeared to him last night in the middle of the night, which, of course, provoked his coming here this afternoon. Barnabas: Well… oh. What did that mean? Roger: She supposedly warned him to stay away from this house. There’s danger here for him, she said. He turns away, frantically searching the prompter for a reasonable on-ramp back into the conversation. Barnabas: What else did she say? Roger: That’s all she said, as far as I know. At this point, you can hear people walking around in the studio, and the squeak of a door. It sounds like the crew have decided that this scene is a mess, and they might as well leave early and beat the rush hour traffic. Yeah, no kidding, Barnabas says. I think I’m living it, right now. He starts lighting some candles, because it’s always nice to keep yourself occupied while you’re figuring out what to say. 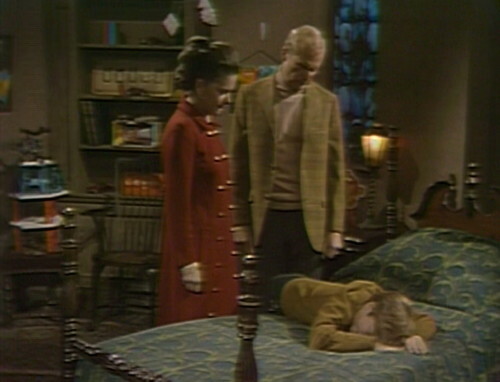 Barnabas: The legends of Collinwood… seem to have affected his mind. Perhaps he should be sent to a special school, where he would get special… care… and attention. He turns toward Roger as he’s lighting the fourth candle, and it doesn’t catch. 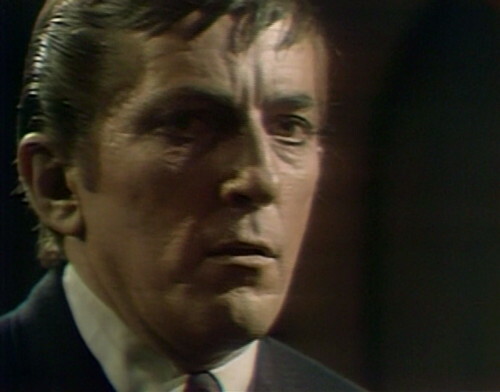 Barnabas: At least… until these… hallucinations are gone. So he still can’t remember his lines, plus now he’s holding something that’s on fire. This isn’t going in a positive direction. Back at Collinwood, Dr. Woodard has a scene with David that goes on approximately forever, and then he goes downstairs to report back to the grown-ups. Woodard: I’m not sure. Roger, it’s just possible — barely possible — that David isn’t imagining these things that have been happening to him. Roger: How is it possible? Woodard: Well… I can’t explain what I mean. All I can say is that I find everything David tells me strange, but interesting. Extremely interesting! So, that’s great; now they have to find a new doctor. Nothing’s going right today. To wrap up, here comes Sarah Collins, the Chromakey Kid. 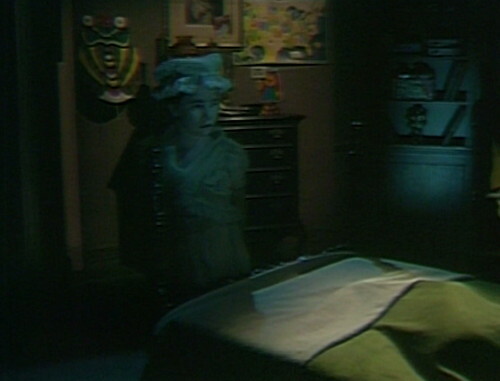 She’s got a Haunted Mansion-style blue-green spotlight today, and it looks fantastic, actually. 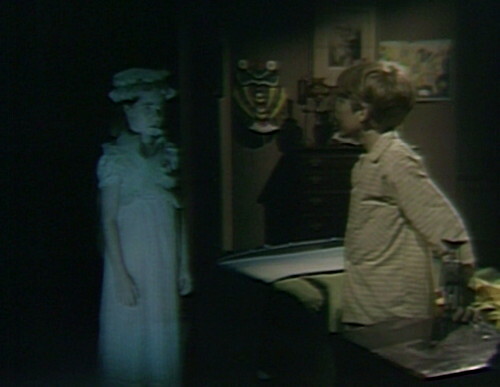 She appears in David’s room, and tells him that he should stay away from the basement in the Old House. Now, the only reason he even cares about this is because of the dream he had last week, where she showed him the coffin in the Old House basement. She keeps showing up and telling him secrets, and then getting mad because he talks to people about ghosts and secrets. He’s getting some seriously mixed signals. And then she’s got a whole new ghost secret for him to not tell people about — a wooden toy soldier that she wants him to keep nearby. This is yet another ghost prop; she seems to have access to an unlimited number of spectral antiques. Sarah disappears, and then we’re pretty much back where we started. Ta-da! 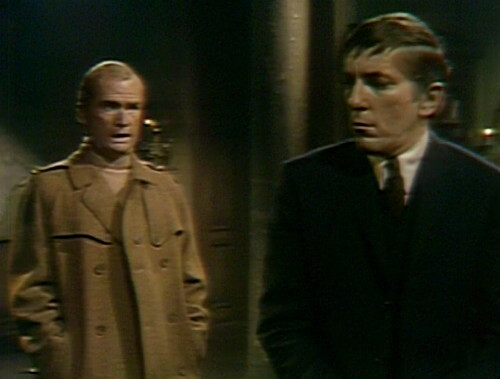 The camera wobbles noticeably as Barnabas invites Roger to sit down. Sarah: It used to belong to someone. Sarah: Someone who played with it, a long time ago. David: Sarah, I promise I’ll keep this. Sarah: I want you to promise that you’ll keep it, and not give it away. David: Yeah, I will keep it. It’s really keen, Sarah. Lol! These posts are brilliant! Kudos to you for somehow managing to pay tribute to such a great show while pointing out and enjoying of it’s fun, often ridiculous eccentricities! Thanks! I’m really glad you like it. How did you first discover and get into the show? I’m sort of amazed that there are still people on the earth who care about it enough to come read a blog about it. I caught a rerun of it one morning when it was still playing on the Syfy channel, back in about 2001. I had seen it advertised every morning (in a satellite guide) and was curious what it was. 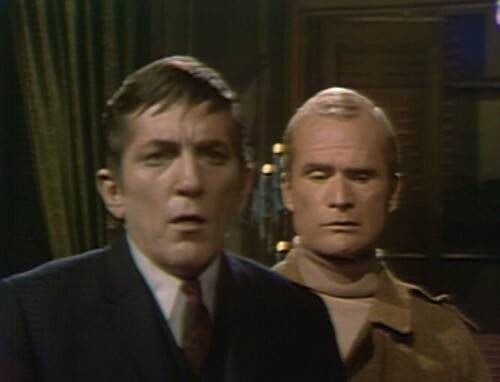 Even the name, “Dark Shadows”, had this wonderful appeal to me. I was lucky to catch it early on in the series (pre-Barnabas even). It had such a great look — the crisp black and white, filmed on video tape so it looked more live-action, as if you were right there. And one episode was all it took — I was hooked. Every episode has a nice little cliff-hanger ending, so I was powerless to stop. I watched it right through till the end when Syfy stopped airing it. It’s definitely one of my favourite shows of all time! I really enjoy what you’re doing on your blog here. You’re right, it is amazing that it’s still popular after all these years. But it was so quirky and fun… how can you not come and read about it? i agree! so much fun. i’m really enjoying these. i’ve been watching each episode, and then reading danny’s entries. soooooooooo fun! Oh, that’s cool — I’ve been wondering if folks became fans from the Syfy reruns. I got hooked on the show in the 80s and 90s, when it was shown on public TV stations. It’s funny that you got hooked during the pre-Barnabas episodes. Did you have any idea what was coming? Oh, no idea at all! 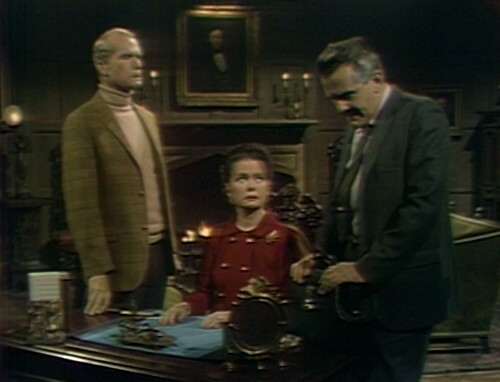 In fact, the first episode I saw was (by Dark Shadows standards) extremely boring. There was a LOT of Liz, Vickie and Roger on the staircase talking about not much of anything at all. But it still had that spooky thing going for it. So you can imagine how thrilled I was when out pops Barnabas and the show went full on supernatural. It was such a smart move and I’m sure it saved the show. Oh, thank you for commenting! I’ve been hoping that people who actually know things will let me know when I get something wrong. I make a lot of jokes, but I don’t want to say things that aren’t true. It’s a shame, because “rubber bat” is such a fun phrase to say, but I’ll correct it. That’s very cool and impressive that you have the actual bat… Is it still in good shape? who got the ralston purina lamp, i wonder!? 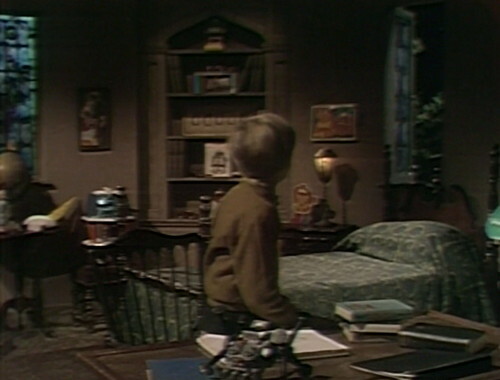 On Friday, David’s Space Crawler toy was on his desk, when the boy was viciously attacked by a Bil Baird marionette. Today, we find that despite his terror in what is intended as ‘just a moment later’, David has returned the Space Crawler to the top of his Space Station toy. Nice to see that some children took care of their things. Oh, fantastic — I love that you’re super on top of the Space Crawler situation. When I did my post about the stuff in David’s room, I guess I didn’t go back this far — the earliest episode I took screenshots from was in November 67, about a month after this ep. The Space Station is gone by then, probably sabotaged by jealous cosmonauts. Happy to help decode the mysteries of the Dave Cave! I will try not to get TOO obsessive-compulsive about it. And wasnt it rich for Barnabas to thoughtfully suggest David be sent to the insane asylum since he is the one who is driving him crazy.